The part that got my attention was “In most cases, employers cannot require you to be a U.S. citizen or a lawful permanent resident”. After researching the point I realized that evidently people can get work visas without becoming a lawful permanent resident. The poster seems misleading to me. This entry was posted on Saturday, December 1st, 2018 at 5:00 AM and is filed under Federal Government. You can follow any responses to this entry through the RSS 2.0 feed. You can leave a response, or trackback from your own site. It all starts with the qualifying statement “If you have the legal right…” It continues, “…employers can not require you to be a US citizen or Permanent Resident.” Having a valid work permit is a completely different “classification”. Seven comments later, still no one has focused in on the key word. The word is “required.” “Employers cannot require” infers that a person who is not a U.S. citizen or lawful permanent resident has the same employment rights as a citizen. Take that one step further, a person who us is bit a U.S. citizen or lawful permanent resident can file an employment discrimination claim against an employer who hires a U.S. citizen rather than the non-citizen. Maybe that’s not what was on Brutus’s mind, but that’s how I read it. The poster makes complete sense, something our immigration laws do not. 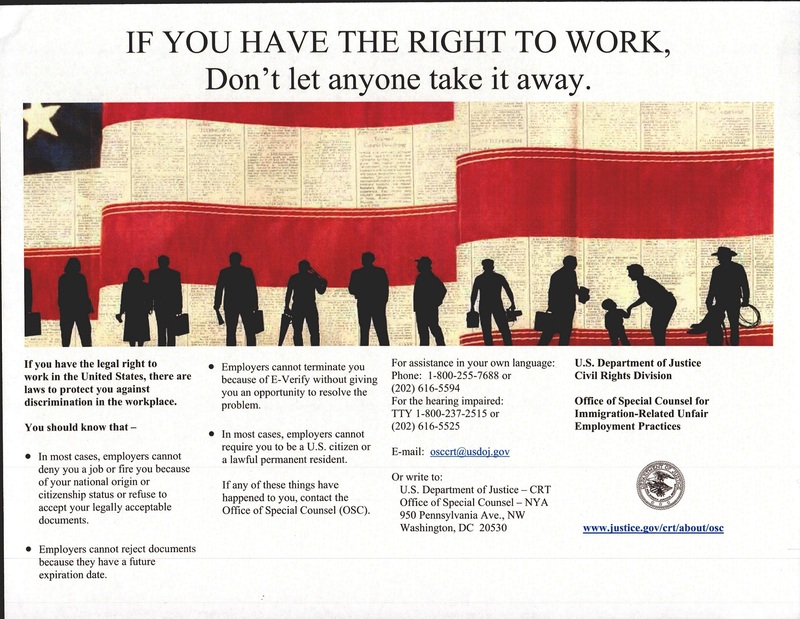 Of course legal foreign nationals have a right to work. In fact, they enjoy all the constitutional protections we do (as it should be) including the right to give birth to a US citizen at UMC. I thought if they were permanent residents they wouldn’t *need* a visa. IIRC, visas have an end date and permanent residencies do not. Illegals have the OPPORTUNITY to work in most businesses in the Sanctuary City of El Taxo. A “Work Visa” here is not a ” required, FORMALITY”. They have counterfeit, stolen Social Security Cards, Birth Certificates, Naturalization Certificates. Ever wonder why you try to get HELP in a store and they say “No English” or they don’t understand the kind of hamburger, chicken or food you want?? THOUSANDS of these JOBS should be for AMERICAN students, workers. The high school, college student trying to help the family with expenses, buy clothes, keep that old car running one more day, paying for graduation expenses. THESE people are the ones who have a “Right to work, a Right to a job”, that goes to someone ILLEGALLY in the country, the City. I shake my head when I hear ostensible conservatives argue against the free market, and for forcing state law enforcement to bow down to the federal government. How the principled have fallen. what “principles” do you have? that anyone you don’t like or agree with can be beaten savagely, sprayed with bear mace, ostracized, called nazi, racist, etc.? those kind of principles? i shake my head when self-described “tolerant” people prove to be violently intolerant and hateful. and then you and your team have the Proud Boys who do the same things to people on the left. both sides have extreme undesirable elements. > what “principles” do you have? An excellent question, and one I encourage everyone to think about and maybe even post here. * non-aggression principle: do not initiate force/coercion on other people. Defend oneself, others, and property if required. * free markets in trade, in ideas, in currency, etc. * leave consenting adults to pursue their life, liberty, and pursuit of happiness. > that anyone you don’t like or agree with can be beaten savagely, sprayed with bear mace, ostracized, called nazi, racist, etc.? those kind of principles? See the “non-agression principle” answer above. > i shake my head when self-described “tolerant” people prove to be violently intolerant and hateful. I shake my head when /anyone/ is violent or hateful. Actions speak louder than words. Partisans assume everyone else is partisan. I do not belong to any political party, as I have said before on this blog. I zero no interest in keeping score on which corrupt, republic-endangering party has done what. They are all scourges, as Pres. Washington warned us they would be. They thrive because straight-ticket voting is easier than thinking for oneself, and spouting belligerent talk show soundbites is easier than meaningful discussion. I’m with anonymous here. The poster does not “sound like illegals can wildly work” here, there, or anywhere! It reads (to me, at least) as if it is pointing out that people who have entered this country with legal work documents (and, that can include a long list of legal residents) cannot be terminated simply because they lack citizenship. No huhu. No fuss. Where do you get the idea that illegals can ‘wildly work’? The poster clearly mentions ‘legally acceptable documents’. The poster may be hard to understand for a lot of immigrants who may have trouble with our language. It may be more directed to employers. If the policy is good for the entertainers you mentioned, or even the First Lady, shouldn’t it also apply to fast food workers? I fail to see the problem in the original blog post. Maybe we readers deserve better. I suppose that’s right . . . Entertainers, singers, musicians, actors and the like get Work Visa’s to work in the USA. Like the Beatles, Ozzy Ozbourne, Liam Neisen, Patrick Stewart, Michael Caine, etc. are not . . . Lawful Permanent Residents or American Citizens. Pierce Brosnan became an American Citizen in 2004, before that . . . used a Work Visa in the US. The POSTER shown above, does sound like Illegals can wildly work there and just hide when INS shows up ! Or that Illegals running from the law. . . have a Right To Work !